Organizations: OOGA, Portage County 4H, Brimfield & Suffield Youth Organizations, National Rifle Association, Boy scouts of America, Prestwick Country Club, and the Carpenters Union. Working at Maple Crest Golf Course in Brimfield, Ohio from the time he was 10 years old helped develop work ethics that carried him through receiving his Certificate of Apprentice as a carpenter in the late 1960’s. In the early 70’s he turned his attention to overseeing cattle operations in Wayne County along with looking after the Monroe Coal Company, located in Muskingum County. These opportunities led him into the Oil and Gas Industry where he never left. Under the guidance of Mr. Bill Tipka Sr., Bob learned the industry and led K.S.T. Oil and Gas into drilling and operating over 1200 wells throughout Ohio. In 1995 after the sale of K.S.T., Bob established Moore Well Services Inc. a service company able to handle all needs of the Industry. His personality and knowledge made the transition easy to establish a successful service company. Being a man of his word, a handshake was as good as a contract. Always preaching strong family values along with his one line comments, he will always be remembered for his strong work ethics. Being the one to put everyone ahead of him, he generously sacrificed his time to benefit many others. Bob was a dedicated advocate to the industry and very proud to be a member of the Ohio Oil and Gas Association. Bob was inducted into the Oil & Gas Hall of Fame in 2011. Jeff Moore was also employed by K.S.T. Oil and Gas Company from 1987 to 1996 where he gained the following work experience: C.D.L. class TX, equipment operator, field mechanic, and installation of natural gas compressors and pipelines. He now supervises the installation of support equipment on oil and gas wells as well as the production after the well construction is complete. He has also attended the Enterra Oil Field School, and completed his O.S.H.A training. Jeff currently sits on the Board of Trustees for the Ohio Oil & Gas Association. 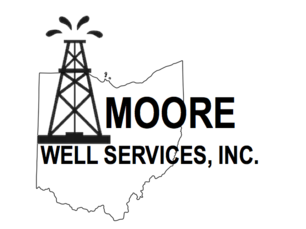 About Moore Well Services, Inc.
Moore Well Services, Inc (“MWS”) an OHIO sub chapter “s” corporation was founded in April of 1996 by Robert Moore. Robert Moore worked for the K.S.T. Oil and Gas Company, Inc for twenty-five years of his first phase of oil and gas development. During his tenure at K.S.T. he gained considerable experience, overseeing the drilling as well as completion and production of over 1200 wells in the state of Ohio. 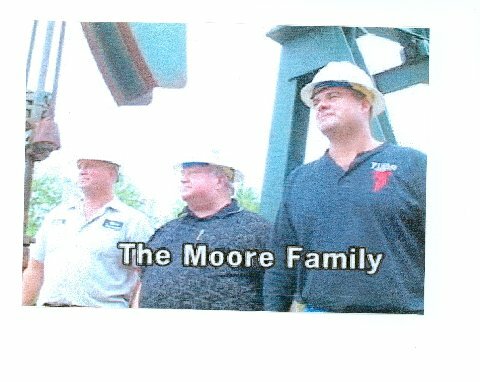 In 1996 Robert founded Moore Well Service Inc. A service company that provided the industry with 24 hour service which performs services in all areas of the oil and gas industry. Ripley, West Virginia and has completed an 8 hour O.S.H.A course. He also helped with the building of Ohio’s first oil and gas fire training facility in Wayne County. The Moore Families at the 2011 Ohio Oil & Gas Hall of Fame Dinner.